In our cleanroom hardware FAQ series, we present the questions which are faced by businesses when selecting cleanroom hardware. Here you will find the most frequent questions with which we are confronted regularly, as well as our answers to these. Keyboard with glass surface - Can be operated wearing gloves. Keyboard attached to HMI system by way of adjustable torque hinge. Internal wiring. Ergonomically adjustable keyboard. 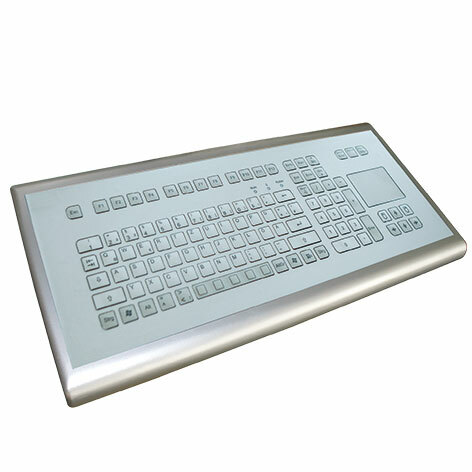 Magnetic keyboard tray for keyboards from Systec & Solutions or external keyboards. We use ethanol/isopropanol/chlorine as cleaning agents - is that a problem? Is there anything particular to look out for on cleaning? 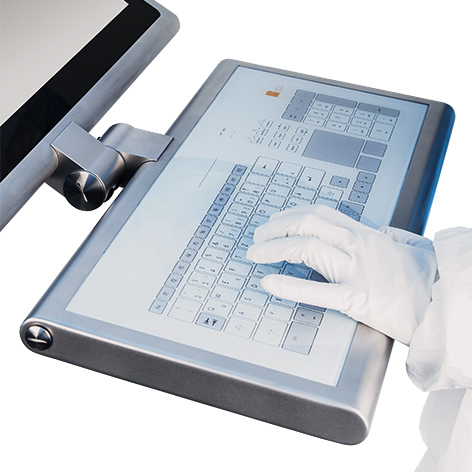 Our keyboards were specially developed for use in cleanrooms with stringent hygiene standards. The keyboards were designed to satisfy the particular requirements associated with cleaning and resistance to chemicals by making the surfaces as smooth and easy to clean as possible. Almost all the cleaning agents and disinfectants generally employed in the pharmaceutical industry can be used. The keyboards comply with IP65 or better, which means that nothing can ingress into the keyboard on cleaning. The front fascia of our membrane keyboard is a biaxially oriented polyester film. It therefore exhibits greater resistance to solvents than conventional films. We would be pleased to send you a resistance list in accordance with DIN 42 115 Part 2. The materials used for the glass keyboard, stainless steel and glass, offer excellent mechanical and chemical resistance properties. Thanks to the back-printed capacitive glass operating panel, the legibility of the key labels does not suffer even over many years of use with regular cleaning. To facilitate cleaning, simply activate the cleaning function. The keyboard then remains disabled during the cleaning operation to avoid any inadvertent entries being made. Is it not possible to just make use of a conventional keyboard/medical keyboard/silicone keyboard? Commercially available keyboards are not suitable for use in cleanrooms, as dirt accumulates under the keys. What's more, the design and materials do not permit regular cleaning with aggressive agents. We also strongly advise against improvised solutions, for instance simply encasing a conventional keyboard in plastic or covering it with film. The hygiene regulations for GMP environments are considerably more stringent than in hospitals or doctors' surgeries. Close attention must be paid to design, connections, materials, resistance and service life before making use of medical or silicone keyboards. Design/connection: The more protrusions and recesses there are in a keyboard, the more complicated and time-consuming thorough cleaning becomes. Dirt can accumulate at USB interfaces and on externally routed cables. Materials/resistance/service life: Silicone can be wiped and disinfected. Frequent typing and cleaning does however lead to the surface of the soft silicone keys becoming rough and worn far more quickly, thus shortening the service life. In contrast to glass and stainless steel, some silicones also only offer restricted resistance to the standard cleaning agents used in cleanrooms. Outgassing may be a further problem with certain silicones, making them less than ideal for cleanroom applications. It is essential to find out beforehand. Which of your keyboards would you recommend to me? Glass keyboards are the most advanced means of text entry. They have progressively taken over from the popular membrane keyboards over the past two years. 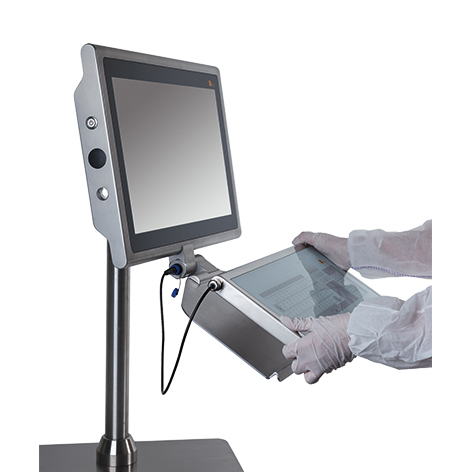 In the final analysis, both technologies are suitable for use in cleanrooms and for high hygiene standards. The right choice for our customers is sometimes just a matter of what best suits their requirements. Glass keyboards operate on the capacitive principle with audio feedback, whereas membrane keyboards feature finger placement and tactile feedback. The keys of a membrane keyboard have to be slightly pressed down to make entries, requiring a certain amount of finger pressure. Rapid ten-finger typing, for example, is not so easy. On the other hand there is less likelihood of pressing a key by mistake, and the tactile feedback provides distinct confirmation. With the glass keyboard, entries are made by capacitive touch sensing, i.e. a finger touching a key produces a change in sensor capacitance. It is therefore not necessary to exert any particular pressure on the keys - just touching them is sufficient. The absence of normal keys can be a bit off-putting at first. Users do however say that they soon become accustomed to this and are even able to type with ten fingers. It is possible to set the operating sensitivity individually. When particularly high standards of hygiene are required with a large number of cleaning cycles, glass keyboards are usually the best option. Their smooth surface makes them easier to clean. They are also better able to withstand cleaning agents and chemicals than membrane keyboards, which are more susceptible to wear. Users who consider it an advantage to have tactile feedback and somewhat firmer, more active key operation may however prefer a membrane keyboard. Membrane keyboards are often favored in the food and beverage industry, e.g. for the production of baby food, where glass could be a source of risk. For customers who nevertheless prefer capacitive text entry, our glass keyboard is also available on request with a laminated protective film to guard against splinters of glass. If you are not sure which keyboard is best for your application, we recommend trying out the keyboards wearing the gloves used in your production environment. We are looking for a keyboard with trackball. Do you supply anything like that? Can you use it with a mouse? We are always being asked about trackballs. We took the deliberate decision not to offer these as they are not ideal for cleanrooms. Dirt builds up around the trackball, where it is very difficult or even impossible to remove. We do not recommend a mouse, as this involves having a cable lying around or connection via Bluetooth. Both options require a USB interface, where dirt can accumulate. Dirt can also gather in the bottom part of the mouse. With a Bluetooth connection, the mouse is battery-operated. A flat battery can affect production processes. Thought should also be given to the surfaces on which the mouse is to be used, as reliable operation cannot always be guaranteed, on stainless steel for example. To nevertheless ensure simple control, our keyboards are provided with a touchpad and we can supply Multi-Touch HMI systems. 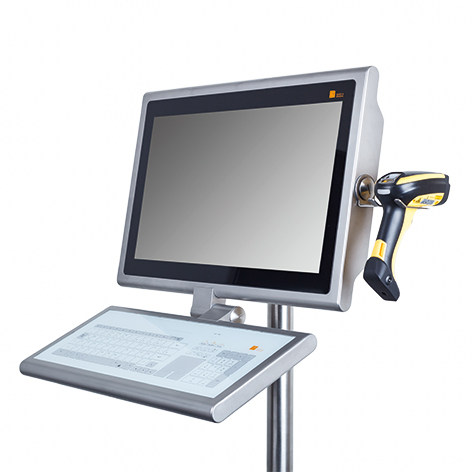 The combination of touch screen and touchpad permits uncomplicated, ergonomic operation without the need for a mouse. To make entries, users do not scroll to a field with the mouse but rather simply click the field on the touch screen with a finger. That is much faster than using a mouse, by the way. Is keyboard user identification possible? Can a card reader be integrated? 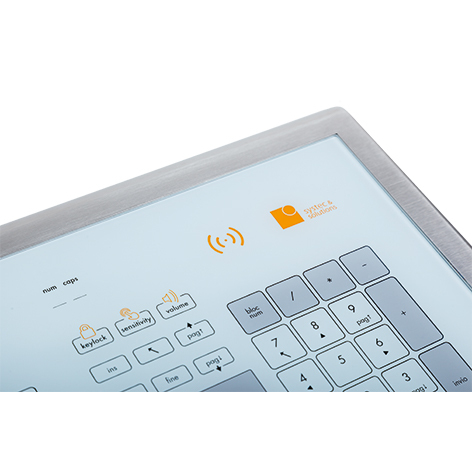 If required, our glass keyboards can also be used with an integrated RFID/NFC or smart card reader for user authentication. Does the keyboard lock automatically to prevent unintentional text entry? We will gladly supply our glass keyboards equipped with an optional auto-lock function. After 30 seconds of inactivity, the keyboard then locks automatically and no further input is possible until it has been released again. We require a special language layout. Is that possible? As standard, we offer the language layouts DE, FR, DK, UK, US, BE, NL, CH and IT. We would be pleased to implement other language layouts for you on request. We use special gloves. Does that pose a problem for working with your keyboards? We have tested our glass and membrane keyboards with up to three layers of cleanroom gloves made of nitrile/latex, and that works without any problem. For working with glass keyboards we recommend wearing the snuggest possible gloves to ensure good conductivity. It is not possible to use non-conductive gloves, such as thick fabric gloves. The keys of glass keyboards and the touchpad also do not react to a stylus or other objects. If you use special combinations of gloves, possibly with undergloves made of other materials, you should always try them out beforehand. We would be pleased to advise you. As a special option for our membrane keyboards we can also offer a resistive touchpad for specific applications. The touchpad can then be operated by applying pressure, which makes it possible to work with very thick gloves as well. The touch sensitivity of the glass keyboard can be adjusted to suit the number of layers of gloves worn by your workers. The volume of the audio feedback can also be set to the best level for your purposes. We do not want any connecting cables. Is a Bluetooth connection possible for the keyboard? The drawback to Bluetooth-connected keyboards is that they are battery-operated. Production processes may be affected if the battery has not been charged or needs replacing. Bluetooth connections are also often subject to interference. In the interests of guaranteeing reliable operation we advise against using Bluetooth. Whether or not cables are visible largely depends on the chosen type of installation. If you decide in favor of installation directly on the HMI system or on the wall, the cable will be routed out of sight inside the adjustable torque hinge. In cases where external cabling cannot be avoided, for example if a bench-mounted HMI system and keyboard are required, we employ special IP65 connections. This avoids having any openings which cannot be cleaned. Can I continue to work with my existing keyboards? Can I use external keyboards? We do not generally recommend doing so, as seamless integration with our HMI systems with torque hinge and internal cable routing is only possible in conjunction with our keyboards. If you cannot avoid using a different keyboard, we would be pleased to offer you a tray for fitting to our HMI systems by way of a torque hinge. The hinge allows setting of the tray angle to suit each individual user. Without Bluetooth it is then however not possible to avoid an external cable. Have you any other questions we have not yet dealt with? Please get in touch with us on +49 (0)721 6634 400, by e-mail to talk@systec-solutions.com or using the contact form below.